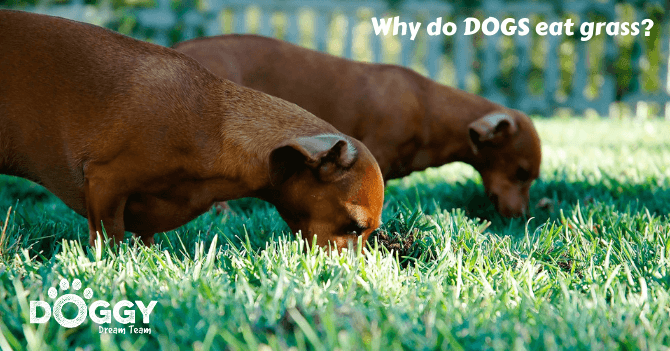 Why Do Dogs Eat Grass? And Is It Good or Bad For Them? We explore!!! / Why Do Dogs Eat Grass? It’s one of life’s little mysteries: Why do dogs eat grass? Or is it. But wait…you say…Dogs eat grass to make themselves sick. Everyone knows that! As it turns out, there’s quite a lot of myth and misinformation about dogs eating grass, so let’s put the record straight. It’s time to bust some myths about why dogs eat grass. Why do dogs eat grass to make themselves sick? Does your dog eat grass then bring up a pile of froth afterwards? It turns out this isn’t as common as you suppose. Since 2008 there have been around four research projects looking at the frequency of vomiting after dogs eat grass. It turns out the percentage of dogs with a strong link to being sick afterward is as low as 8% in one study, rising to 22% in another. This still means less than a quarter of dogs that eat grass are regularly sick, so perhaps we should keep looking for our explanation. Why do dogs eat grass when they are unwell? Actually, it turns out that this also is a myth and there no evidence of a link between grass eating and ill health. Those studies looking at the frequency of with which dogs vomited after eating grass, also inquired after the dog’s state of health. It turns out most herbage-eating hounds are bouncing with good health in the first instance. Only a small number of grass-eating chow hounds, around 8% at most (from the study where 22% regularly vomited) showed signs of ill health before eating their organic dinner. 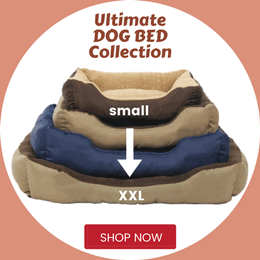 These days many of our dogs eat processed food consisting of kibble or canned meals. On the face of it, this process food could well contain reduced amounts of fiber compared to a natural diet of a freshly killed rabbit. So the argument that dogs are seeking extra fiber at least sounds plausible. Grazing on grass is indeed a natural source of vegetable fiber ,which helps with regular bowel movements. But guess what? There doesn’t seem to be a link. Those ever inquisitive scientist compared the grass eating habits of dogs on naturally high fiber diets with those on low residue foods. It turns out which type of food the dogs ate had no statistical bearing on whether they ate grass or not. Another grass eating myth blown out of the park. So Why Do Dogs Eat Grass? Actually, a dog eating grass mimics the behaviour of wolves. You guessed it….researchers picked through wolf poop and found grass fiber. Indeed, wolf stools can contain between 11 – 47% grass fiber. It turns out grass has natural deworming properties, which help to clear the gut of parasites. The theory is that eating grass causes strong contractions of the gut wall, which dislodges intestinal worms. The grass blades then wrap round the parasites, pull them along for the ride, so they are passed out in poop. However, this doesn’t mean you should throw away those prescription worming medications. Grass eating can only ever lower a parasite burden, rather than fully eliminate them. And remember, our pet dogs live a lot longer than wild wolves, precisely because of the advantages of modern preventative care. Should you let your dog eat grass? It might just be that the green stuff tastes nice to dogs. But should you let your dog eat grass? If the grass is growing naturally and not covered in pesticides, there’s little harm in a dog or puppy eating it. Indeed, most dogs seem to enjoy eating grass, so leave them to it. However, one word of caution. Eating a lot of long grass does carry a slight risk of causing a particular type of bowel obstruction. Those long grass blades can twist together to form a long string-like length of knotted stalks. If one ends becomes anchored in the stomach and the other end travels down the intestine, this can cause the gut to concertina up on itself. Although rare, this condition is like having a linear foreign body and can have serious consequences. The signs of this complication include extreme dullness, uncontrollable vomiting, and lethargy. And the treatment is surgical removal of the grass from the intestine. Ouch! Why do dogs eat grass? An instinctive urge to get rid of parasites seems the strongest contender. Can dogs eat grass? Yep, but just be sure to cut the lawn regularly to avoid chowing down on long blades. If your herbage hound likes to go green, there’s no need to stop him. But as to why he loves the green stuff…it could be as simple as grass tastes nice to dogs.